A recent trip to the antique store produced three World War One era postcards. It is rare for me to find European postcards with World War One subjects but in this case I found three! The first one features a German Dragoon in full dress uniform. His unit is Dragoon Regiment “Prinz Carl” according to the reverse side. The reverse side also appears to show the unit’s barracks. 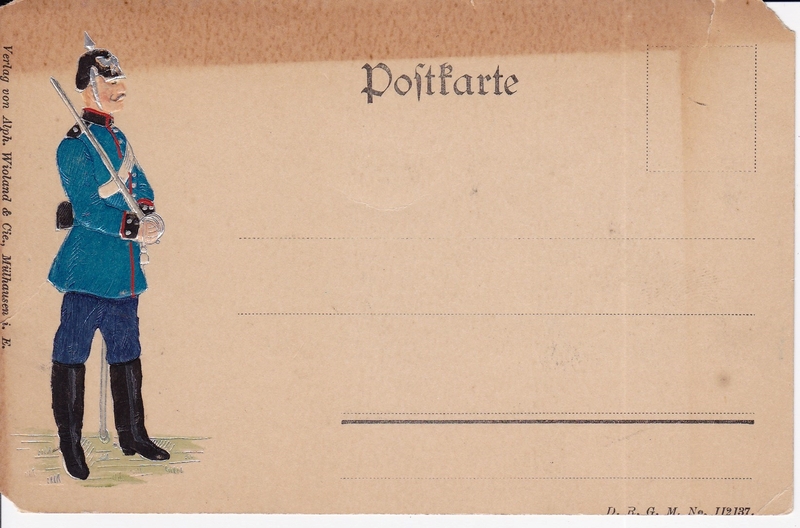 The card is not dated and so my guess is that it is pre-World War One. 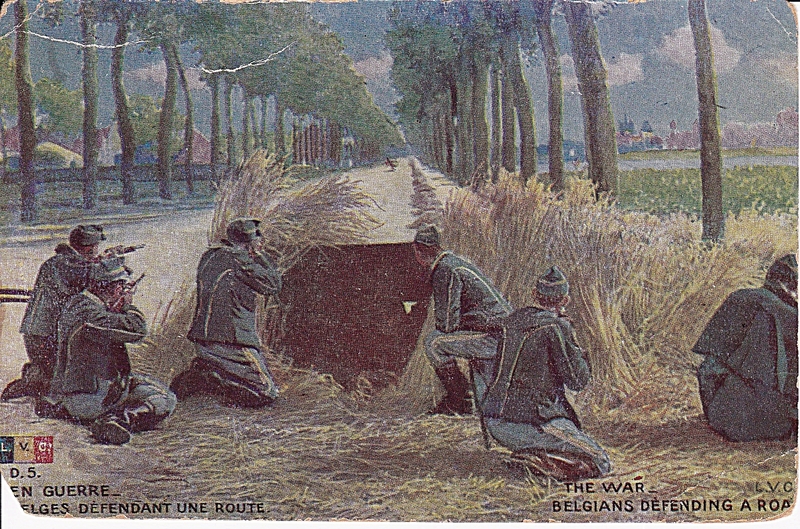 The next color postcard features Belgian soldiers defending a road. Given the uniforms I’d say the card represents a scene from the earliest days of World War One. The writing on the back of the card is extensive. 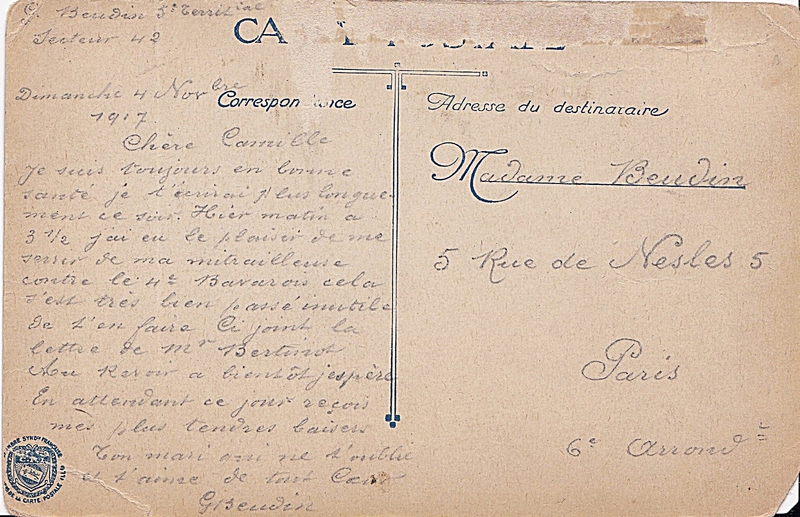 The address is “Paris” and the recipient appears to be the sender’s sweetheart. It’s dated, November, 1917. A French soldier sends a postcard to his sweetheart in Paris. The last card’s caption is written in Italian. 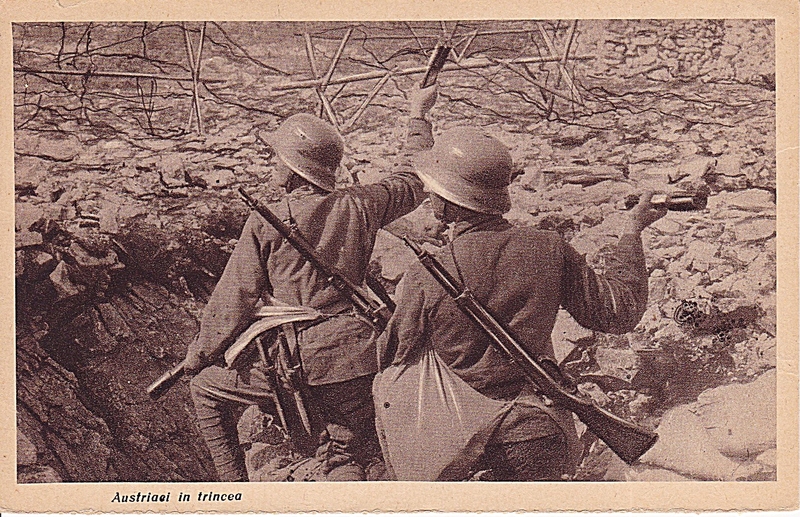 Translated it reads “Austrians in the trenches.” There isn’t any writing on the back. The soldiers appear to be armed with 1895 Steyr-Mannlicher carbines which would indeed make them Austrians. By 1916 the Austrian Army had disposed of their pike-gray uniforms and soft caps and gone to field gray uniforms and steel helmets. At a glance they would be indistinguishable from their German allies. What is more interesting about this card is that it’s in Italian. After Italy declared war on Austria-Hungry the two countries fought the Twelve Battles of the Isonzo. The battles were in present day Slovenia then part of the Austro-Hungarian Empire. The Italian objective was to take the Italian speaking City of Trieste. The 12th battle is also known as the Battle of Caporetto. The Austrians reinforced by German Divisions and commanded by a German General broke the back and forth stalemate that had developed and routed the Italian 2nd Army. Austria-Hungary had been tottering in the war and the Germans sought to keep their ally in the war by taking Italy out of the war. The Twelve Battles had taken an enormous toll of lives on both sides with little gains made until the final battle. If my memory serves me correct, postcards were as good as war posters for propaganda tools. In a recent article I did on the Angels of Mons, at the bottom of the article is a great postcard based on a painting by W.H. Margetson. These and many more served as great visual aids of war. too bad there was no date and addresses on the Italian card. That theater of war is/was a mystery to most Americans. Ernest Hemingway of course was wounded there as a red cross ambulance driver. And didn’t Rommel make his initial reputation there? Read a book titled “Sardinian Brigade” last year that I found in a used bookstore. Great book. That brigade distinguished itself in the war at Isonzo and on the Asiago Plateau. Thanks for stopping by Mike. Yes, a date would have been nice. I read that most of the Italian speaking Austro-Hungarians were loyal to the empire so maybe the card was printed by them? The caption is not hostile and the soldiers are posed to give a well equipped impression. In other word it does not look like a card printed by the enemy. You are right about most Americans. Some are just vaguely aware we were involved and the Italian front would not even be on the radar unless they knew something about Ernie H.
I thought Rommel gained his initial reputation on the Romanian Front but it could very well be Italy and the 12th battle. I’m trying to learn more about the Great War myself esp the years prior to American involvement. Thanks for the comments! I think you are right. Looking it up I see that Rommel as a young Lieutenant made a attack that broke thru Romanian lines. The Romanians and their Russian allies had to fall back from the mountain passes to a new line in the plains. But later in Italy is where he won the Pour le Merite aka the Blue Max equivalent to our Medal of Honor or to the Brits Victoria Cross. Heh Mike, thanks for looking it up. Do you know when he wrote his book on infantry tactics? I did not know the Pour le Merite was the equal of the MH or VC. I would have guessed the Iron Cross. Not sure of publication date of Rommel’s book “Infantry Attack”. But it was probably written during his 1929-1933 tour of duty as an instructor at the Dresden Infantry School. That would make sense. By then he would have been promoted I suppose. Apparently you have studied him to some extent. Do you think he was overrated in WW2 and or an opportunist with A.H.?